Home > Current Buzz > Saved those 80's Pants? and Sinead Plunkett-Blazi rehearse Fame - The Musical, which runs from Feb. 28 until March 2 at the Shadbolt Centre for the Arts. 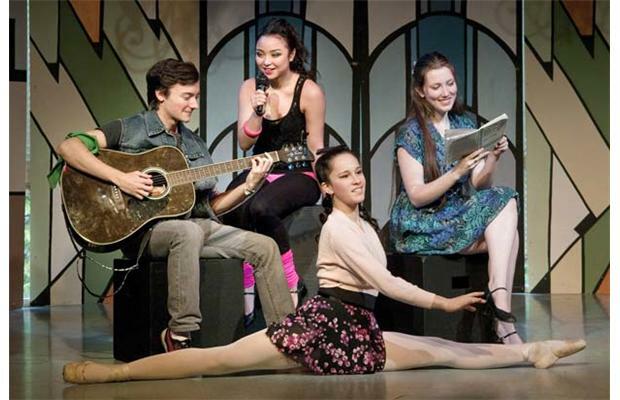 T'is the season for musical theatre at local high schools. Final rehearsals are underway at St. Thomas More Collegiate for the school's production of Fame - The Musical, which runs Feb. 28 to March 2 at the Shadbolt Centre for the Arts, as well as Burnaby North Secondary's production of Guys and Dolls, running March 6 to 9 at the school. Julia Webber, drama teacher at St. Thomas More, said the annual main stage show alternates each year between a play and a musical. Fame was chosen this year for its more modern, dramatic style to add variety to the repertoire of main stage productions the school has produced in the last few years. "One of the reasons is that it's appealing to a high-school age audience because it deals with everything from body image issues to relationships to addiction to all sorts of things," she said. There are 29 cast members and about 23 music students in the orchestra, as well as a student crew backstage. Audience members are invited to dress in their best '80s fashion in order to be entered to win prizes after the performance. At Burnaby North Secondary, drama teacher and producer Courtney Couch said she chose to produce Guys and Dolls for her school's drama show this year because of its familiar but classic style. "There hasn't been a musical here for a while, so we're excited to bring it back," she said. "It should be fun." This cast includes 36 on stage, as well as about 15 band students in the orchestra, plus another six to 12 in the set crew. Other students in design and marketing classes have also been involved in producing marketing material and promotions for the show, Couch noted. Tickets to see Fame are $14, available at tickets.shadboltcentre.com. Tickets to see Guys and Dolls are $10 for students and $12 for adults, available from the school office. For tickets, call 604-664-8550.